When Grace was eight years old, her parents enrolled her in a summer arts program run by the Stratford Art Gallery. That is where she met a teacher named Alan Dhingra, artist, print maker, and graduate of the prestigious Ontario College of Art & Design. Alan recognized Grace’s talent, took an interest in her work, and encouraged her artistic development. For several years, he worked with Grace in his St. Mary’s, Ontario studio. Alan embraced both the challenges and the inspirations of working with Grace, and his flexible approach to teaching accommodated Grace’s special needs and talents. Grace and her family are grateful for his support and encouragement. Much of Grace’s art has been in the medium of monoprinting. First, she paints or draws on a hard, non-absorbent surface like wood, styrofoam or plexiglass. 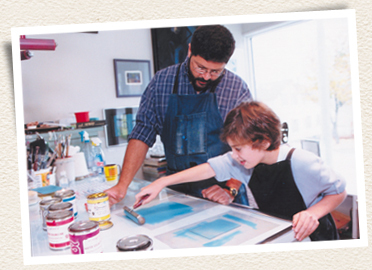 The image is then transferred onto paper using a press, which creates the print. In addition, Grace uses brushes to create painterly pieces with a bright and diverse palette of colours. Grace has also worked with mosaics and mixed media, using her fingers, sticks, rags and rollers to create a variety of graphic effects. She has also enjoyed working with pastels. Like any artist, Grace’s style is continually evolving as she seeks to express herself in new ways and explores new media and techniques. Among her favourite motifs are stars and hearts, which appear in a variety of her pieces. Check out Grace’s art in the gallery.